Agriculture - Plow shares, Planter runners, Sickle sections, Combine fingers, Ammonia knives, Wear plates, Harrow and plow discs, Chisel points, Tines, Sweeps, Flails. The self-sharpening effect comes from the unique wear pattern established by the Hardonite layer. The softer base metal wears at a greater rate exposing the coating at the leading edge. This wear pattern results in a consistent tool performance throughout the parts life. Unlike hand-welded hardfacing, the Hardonite coating is smooth and uniform, as well as, more consistent from piece to piece. Hardonite is applied as a flow coating and permits the mass production of low cost, durable coated parts. Hardonite extends the wear life of a high volume part without driving the cost to unacceptable levels. Hardhitter.com offers a series of custom Hardonite formulations depending on the application requirements. The Hardonite material consists of a combination of proprietary metal alloy powders, carbides, binding agents and viscosity control components. A liquid agent is added to control the viscosity, depending on the application requirement and physical part shape. such as a tiller tine. - Easily applied over irregular shaped cast or wrought ferrous materials. - Reduced labor costs because parts don't need to be changed as often. - Smooth finish reduces drag. - Not as brittle as tungsten carbide. - Coating thickness from 0.002" to 0.100". - Application methods include flow-coating, spraying and dipping. - Runoff is recycled for zero waste. After the Hardonite process is completed the parts can then be heat treated by conventional methods to provide specific hardness to the underlying base material. Parts coated with Hardonite last as much as three times as long as uncoated parts, especially in sandy and abrasive soils. The longer the cutting system remains sharp and efficient, the longer the machine can remain profitably operating in the field before the components need to be reground or replaced, Also, a sharp and efficient cutting system increases throughput speed and substantially reduces fuel consumption. 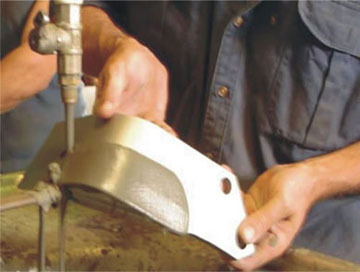 Hardhitter.com made its reputation by manufacturing state-of-the-art, durable, cutting system components that are used on all types of OEM forage harvesting equipment. Hardhitter.com manufactures Hardonite coated rotating knives, as well as, stationary knives, or shear bars and has developed an in-depth understanding of the entire cutting system and its interaction with the crop being process. HARDONITETM process permits Hardhitter.com to coat metal parts with a low cost, mass produced, smooth wear coating that is particularly effective at resisting abrasion. The material consists of alloy powders, carbides, and fluxes. By varying the amount of viscosity control agents. HARDONITETM can be applied either as a slurry or sprayed on. 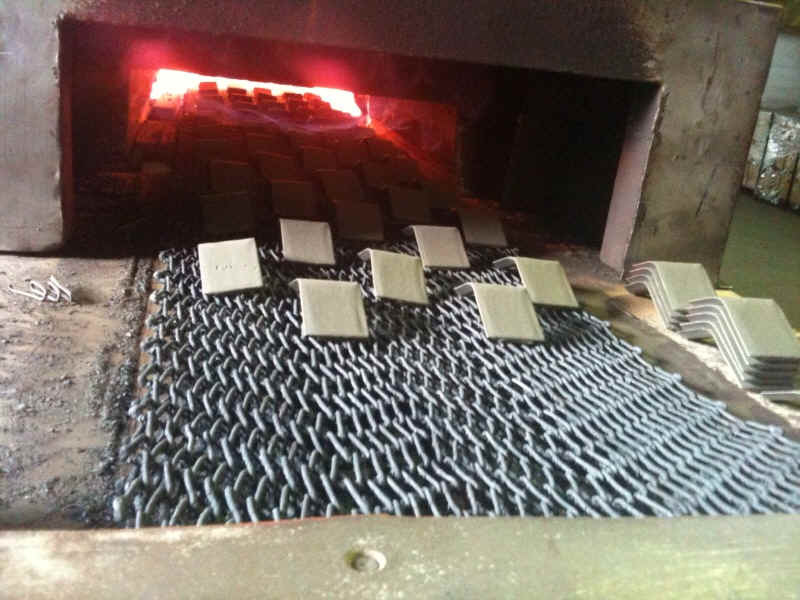 The coated parts are dried, and then sintered in a controlled atmosphere furnace. This fuses the material to the substrate with a true metallic bond. If desired, the parts can then be heat treated to the desired mechanical properties. HARDONITETM can be applied at virtually any thickness. However, the optimal range for ground engaging applications is 0.025 " to 0.040". Hardness typically is in the range of 60 to 65 Rockwell C.
HARDONITETM can be applied to steel, iron, or other metal substrates. Along with material selection and wear resistant surface treatment, a third key to a long lasting cutting or wear component is its heat treatment. 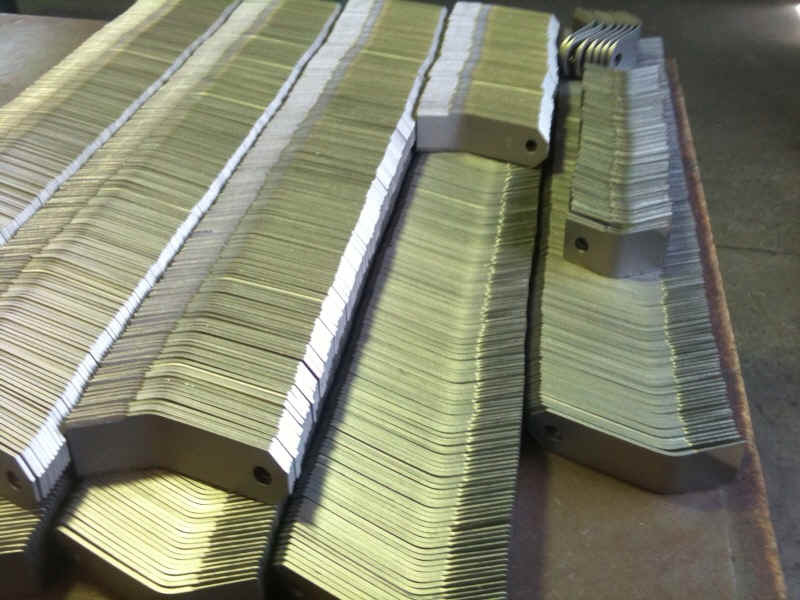 Depending on the application, Hardhitter.com will utilize several types of heat treating, including selective zone hardening, through hardening, austempering, and carburizing. Often, a combination of heat treatments is used to optimize the performance of the wear part. In the case of a cutting part, selective edge hardening is often employed. In its "soft" state, the cutting part is essentially useless. In the heat treatment process, the cutting edge is heated to over 1800 degrees F. On subsequent cooling the steel undergoes a transformation to Martensite. This process produces a cutting edge that is very hard and that will retain its sharpness far longer than the untreated steel. The mounting body of the knife, however, is not affected by this treatment. Accordingly, it remains ductile and tough. It can bend under load without breaking or taking a permanent set. where HARDONITETM coating becomes fused with the base material. Furnace temperatures and atmosphere are precisely controlled, recorded and monitored to assure consistent, part to part coating quality. This accurate control produces a uniform, smooth, abrasion and corrosion resistant metal coating. Then after the fusing process, every part is inspected for coating smoothness and integrity. The final step is the heat treatment phase where the HARDONITETM parts are processed in a continuous furnace to specific customer requirements.